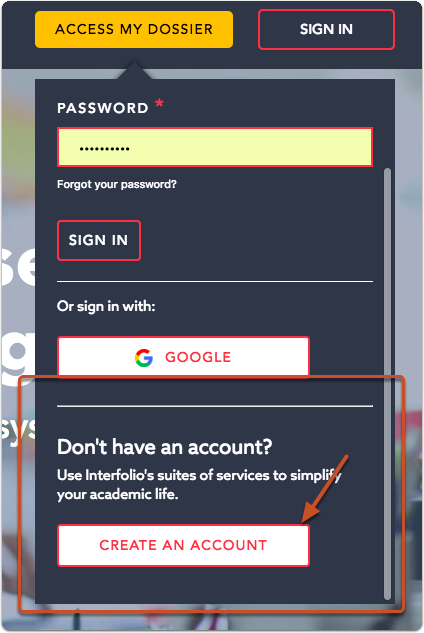 When you create a new Dossier account, you gain access to a unique suite of features specifically designed to help you simplify your academic life, including requesting and sending confidential letters of recommendation when applying for jobs and other academic opportunities. 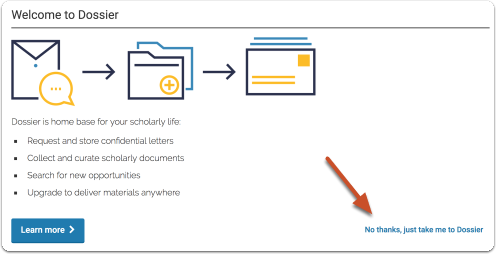 Once you've requested, collected, and organized your academic documents and confidential letters, upgrade to Dossier Deliver to get started delivering your Dossier materials to faculty jobs, post-docs, fellowships, and more. 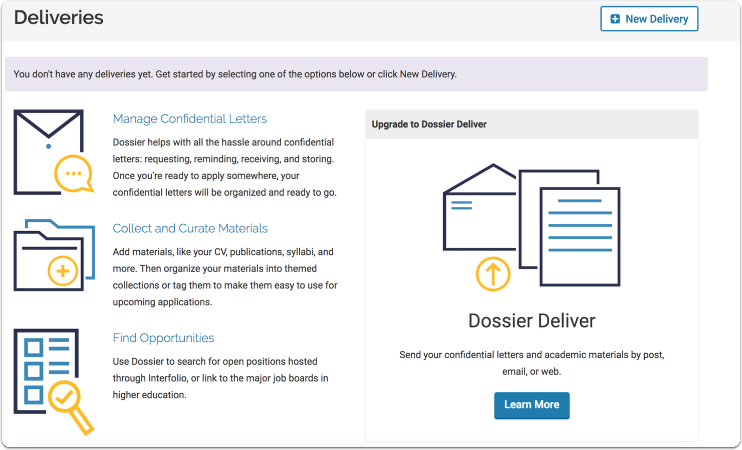 For an annual $48 subscription to Dossier Deliver, you get 50 deliveries via electronic and mail options (Priority and Fedex not included), and can send any materials in your Dossier, including confidential letters. Feel free to submit a request to salesforce if this is a regular item that would require content. Feel free to submit a request to salesforce if this is a regular item that would require content. 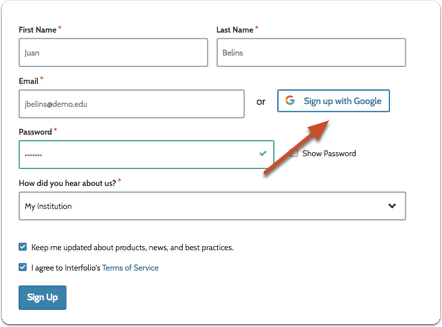 Fill out the account creation form, agree to the terms of service and click "Sign Up"
You can sign up using your email, or sign up with your Google account. 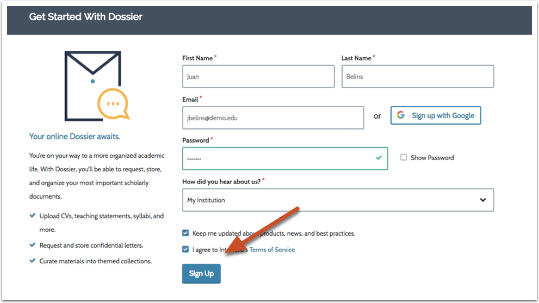 From here you can get started using Dossier to manage confidential letters, collect and curate materials, and look for employment or other academic opportunities. 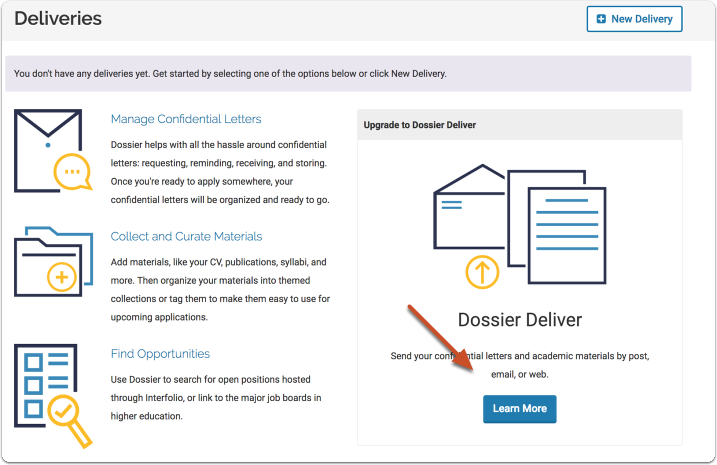 We encourage you to upgrade to Dossier Deliver so you can create deliveries to send the letters and other materials in your Dossier to job applications, reviews, and other academic opportunities.